To order this product, it is necessary to login and join the associated club. Do you want this product in your team- or company design? Everything is possible with us! Fast delivery, outstanding quality, competetive prices and uncompromisingly design. "Ett linne som varken är för tajt eller för pösigt. Passar perfekt som tävlingslinne." The women's Run singlet is a great running singlet for extra hot days and long training sessions. The singlet is light and comfortable to wear, and is made in a breathable material that has good moisture transfer. There are also ventilating panels at the sides which provide extra ventilation. The singlet is also suitable for activities such as CrossFit, spinning and athletics. Ett linne som varken är för tajt eller för pösigt. Passar perfekt som tävlingslinne. Do you have any questions about Run singlet women's? A - Arm length: With your arm in a slightly bent position, measure from your shoulder, along lengt of your arm to wrist. 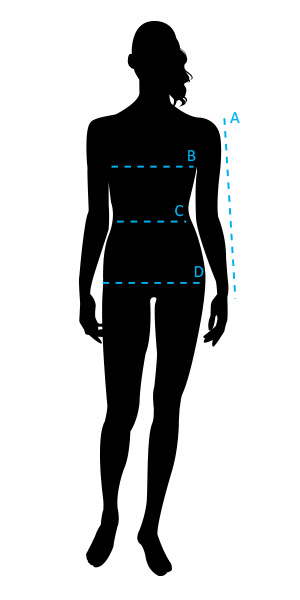 B - Chest: Measure around your chest/bust, holding the measuring tape under your armpit. C - Waist: Measure around your waist at the narrowest part. D - Hip: Measure around your hips at the widest part. About 20 cm below the waistline. Tip: If your bode measurments are between two sizes, choose the lower size for at tighter fit and the higher size for a more loose fit. Workout clothes for those who prefer a more classic and slightly looser fit. These garments have normal sizing, so choose your regular size. Tightly fitted workout and competition clothes. Developed to suit active people who wish to wear garments that don't flap or slow them down. Some choose to adjust by buying these garments one size larger than normal. Competition clothes for elite athletes. The clothes focus particularly on aerodynamics and speed. The garments feel like they are glued to the body.